Die Martis, 27 Julii, 1641. Charge, &c. of the Army. 1a vice lecta est Billa,AN Act for Alteration of the Tenure and Nature of Gavelkind, for some certain Manors, Lands, Tenements, and Hereditaments, in the County of Kent. 3a vice lecta est Billa, An Act to enable Sir Alexander Denton Knight, to sell the Manor of Barnard, and other Lands in the said Act mentioned, for Payment of his Debts, and Preferment of his younger Children; and, upon Question, passed. 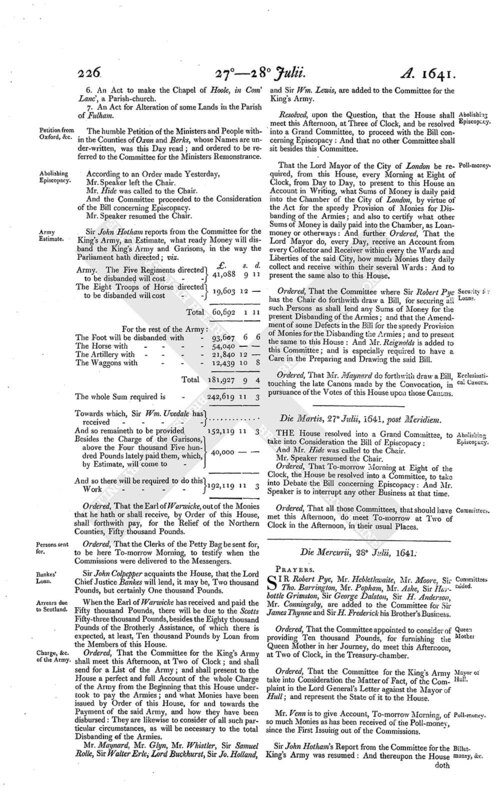 Upon the Question of passing the Bill for the Alteration of the Tenure of some Lands within the Parish of Fulham, &c.
With the Yeas that went out 76. With the Noes that staid in 68. Ordered, That a Conference be desired with the Lords, concerning the Judges, that have been impeached by this House, to desire, that they may not be in the Commission of Oyer and Terminer for the next Assizes: And Sir Tho. Barrington is to go up with a Message to the Lords to this Purpose. Ordered, That Isaac Bush, Robert Benboe, Thomas Benboe, and Robert Johnson, Messengers attending the Great Seal, be forthwith summoned to appear before this House, to give an Account for their Neglect, in not using better care and Diligence in sending forth the Commissions into the several Counties of the Kingdom, for assessing, collecting the Monies appointed to be assessed and rated, by virtue of an Act for the speedy Provision of Monies for disbanding the Armies, &c.
3a vice lecta est Billa, An Act for Bringing in of Gunpowder and Salt-petre from foreign Parts; and for the free Making of Gunpowder in this Realm; and, upon Question, passed. 3a vice lecta est Billa, An Act for the Prevention of vexatious Proceedings touching the Order of Knighthood; and, upon Question, passed. 3a vice lecta est Billa, An Act for the Declaring unlawful and void the late Proceedings touching Ship-money; and for the Vacating of all Records and Process concerning the same; and, upon Question, passed. Sir John Colpepper carried up these Bills following; viz. 1. An Act for the Bringing in of Gunpowder. 2. An Act touching Ship-money. 3. An Act to enable Sir Alexander Denton to sell Lands. 4. An Act concerning the Order of Knighthood. 5. An Act to settle the Manor of Belgrave upon Wm. Byerley Esquire. 6. An Act to make the Chapel of Hoole, in Com' Lanc', a Parish-church. 7. An Act for Alteration of some Lands in the Parish of Fulham. 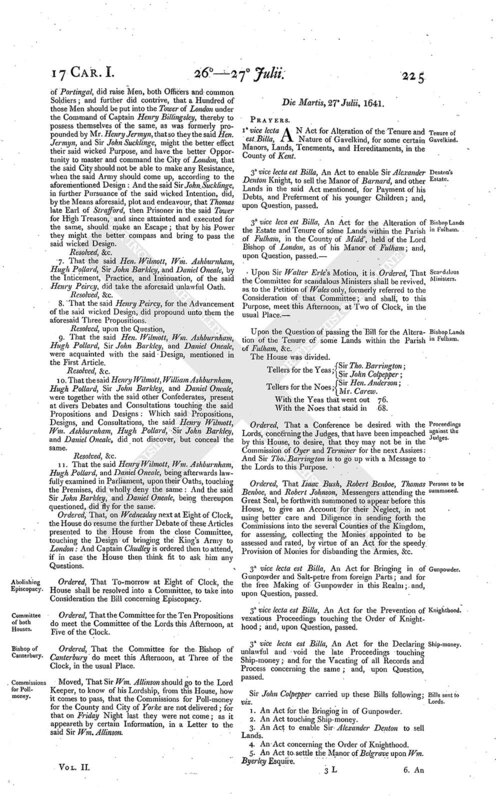 The humble Petition of the Ministers and People within the Counties of Oxon and Berks, whose Names are under-written, was this Day read; and ordered to be referred to the Committee for the Ministers Remonstrance. Mr. Hide was called to the Chair. And the Committee proceeded to the Consideration of the Bill concerning Episcopacy. Sir John Hotham reports from the Committee for the King's Army, an Estimate, what ready Money will disband the King's Army and Garisons, in the way the Parliament hath directed; viz. Towards which, Sir Wm. Uvedale has received - - - - - . . . . . . . . . . . . Ordered, That the Earl of Warwicke, out of the Monies that he hath or shall receive, by Order of this House, shall forthwith pay, for the Relief of the Northern Counties, Fifty thousand Pounds. Ordered, That the Clerks of the Petty Bag be sent for, to be here To-morrow Morning, to testify when the Commissions were delivered to the Messengers. Sir John Colpepper acquaints the House, that the Lord Chief Justice Bankes will lend, it may be, Two thousand Pounds, but certainly One thousand Pounds. When the Earl of Warwicke has received and paid the Fifty thousand Pounds, there will be due to the Scotts Fifty-three thousand Pounds, besides the Eighty thousand Pounds of the Brotherly Assistance, of which there is expected, at least, Ten thousand Pounds by Loan from the Members of this House. Ordered, That the Committee for the King's Army shall meet this Afternoon, at Two of Clock; and shall send for a List of the Army; and shall present to the House a perfect and full Account of the whole Charge of the Army from the Beginning that this House undertook to pay the Armies; and what Monies have been issued by Order of this House, for and towards the Payment of the said Army, and how they have been disbursed: They are likewise to consider of all such particular circumstances, as will be necessary to the total Disbanding of the Armies. Mr. Maynard, Mr. Glyn, Mr. Whistler, Sir Samuel Rolle, Sir Walter Erle, Lord Buckhurst, Sir Jo. Holland, and Sir Wm. Lewis, are added to the Committee for the King's Army. Resolved, upon the Question, that the House shall meet this Afternoon, at Three of Clock, and be resolved into a Grand Committee, to proceed with the Bill concerning Episcopacy: And that no other Committee shall sit besides this Committee. That the Lord Mayor of the City of London be required, from this House, every Morning at Eight of Clock, from Day to Day, to present to this House an Account in Writing, what Sums of Money is daily paid into the Chamber of the City of London, by virtue of the Act for the speedy Provision of Monies for Disbanding of the Armies; and also to certify what other Sums of Money is daily paid into the Chamber, as Loanmoney or otherways: And further Ordered, That the Lord Mayor do, every Day, receive an Account from every Collector and Receiver within every the Wards and Liberties of the said City, how much Monies they daily collect and receive within their several Wards: And to present the same also to this House. Ordered, That the Committee where Sir Robert Pye has the Chair do forthwith draw a Bill, for securing all such Persons as shall lend any Sums of Money for the present Disbanding of the Armies; and that the Amendment of some Defects in the Bill for the speedy Provision of Monies for the Disbanding the Armies; and to present the same to this House: And Mr. Reignolds is added to this Committee; and is especially required to have a Care in the Preparing and Drawing the said Bill. Ordered, That Mr. Maynard do forthwith draw a Bill, touching the late Canons made by the Convocation, in pursuance of the Votes of this House upon those Canons. And Mr. Hide was called to the Chair. Ordered, That To-morrow Morning at Eight of the Clock, the House be resolved into a Committee, to take into Debate the Bill concerning Episcopacy: And Mr. Speaker is to interrupt any other Business at that time. Ordered, That all those Committees, that should have met this Afternoon, do meet To-morrow at Two of Clock in the Afternoon, in their usual Places.